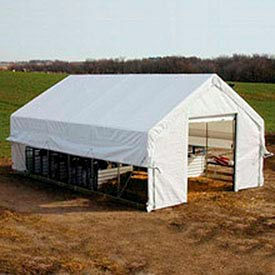 Animal Housing, Chicken Hutches, Small Livestock Pens, Equine Sheds & More. Modular style systems are the best of the best when it comes to safe pet containment. Attractive, powder coat finished panels have smooth clean surfaces; no sharp or rough edges. 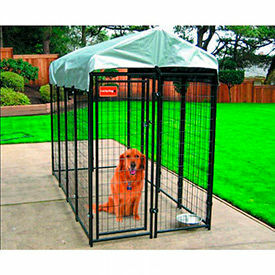 Kennels are built for both durability and good looks; made using commercial grade steel framing with 10 gauge welded wire mesh and a square tubular design. This modular panel system allows you to customize your layout to suit your pet’s needs for comfort and space. Weatherguard top is included for safety for your pet from the elements. 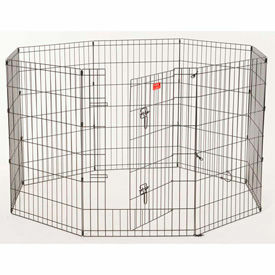 Kennel kits include panels, gate panels, clamps and gate latch. Lucky Dog®, Euro modular panel system surpasses all other kennel containment options in the retail market. These attractive, powder coat finished panels are build for both durability and looks. This modular panel system allows you to customize your layout to suit your pet’s needs for comfort and space. Color is Black. 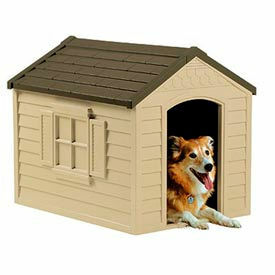 Suncast® Dog Houses Provide A Convenient Outdoor Home For Pet Dogs. Crowned floor with channel around inside edge helps capture fluids and keep your pet dry. Dog house can be staked to the ground for stability. Vinyl doors are included. Durable resin construction is corrosion and impact resistant. Includes removable roof for easy cleaning on interior. Vents provide air circulation. Easy snap-together assembly. Lucky Dog Dog Exercise Pens Are Portable And Secure for Training And Traveling Purposes. Lucky Dog Dog Exercise Pens are made of steel for long lasting durability. Includes stakes for easy set up and to provide stability in ground. Partial gate with latches provides easy reach into the pen. Width is 24". Heights and sidewall heights are 24", 36", and 48". Color is Black. 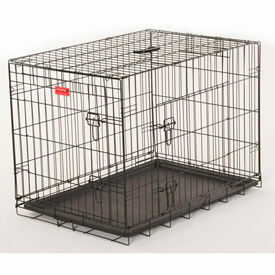 Lucky Dog Dog Training Crates Are Used For Puppies And Up To 85 lbs. For Dog Training Purposes. 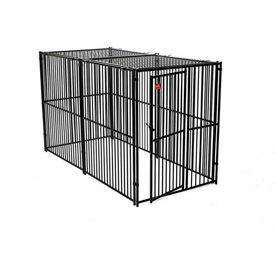 Lucky Dog Dog Training Crates are made of steel for long lasting durability. Double doors enable easy access and versatile crate positioning in vehicles. Dual safety latches on each door provide additional security. Safety latches on the training crate must be rotated up 180° before they can be opened laterally, preventing your pet from pushing or forcing open the latches. There are 4 Clip-on rubber floor protectors and a removable ABS Plastic crate tray. Units have a collapsible design for easy transport and storage. Rust-resistant E-coating finish provides added durability. Made as a puppy training crate, and/or dog training crate. Color is Black. Dimensions vary per model. 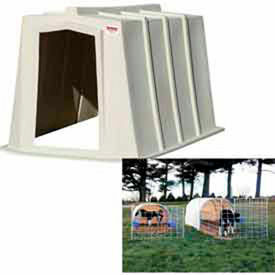 Provide A Nourishing Environment For Your Calves With These Moo-Tel™ Calf Nurseries. Moo-Tel™ Calf Nurseries are made from 14 gauge Allied Gatorshield® structural steel tubing with EZ-Lock slip fittings, making construction quick and easy. Sidewall height for all models is 6' 5". End frame utilizes 16 gauge, 1.5" square tubing. 5'H roll-up sides come with Universal Joint Hand Crank Assembly, hardware and ground posts. White 12.5 oz. premium cover comes with a 15 Year Warranty. Moo-Tel™ Calf Nurseries With Doors come with one 8' x 8' double-zippered door and one 8' x 8' commercial grade steel roll-up door. Chick-Inn Chicken Hutches Provide A Healthy And Safe Environment That Allows Free-Range Exercise, Safe From Predators. 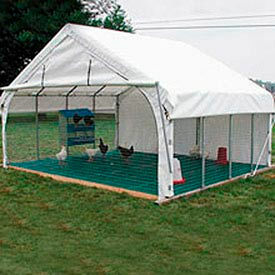 Chicken hutches feature white covers made from 12.5 oz., 24 mil premium rip-stop polyethylene. Includes easy roll-up side curtains for ventilation and sunshine, ensuring more egg production and healthier birds. Double-zippered roll-up door included on rear panel. Chick-Inn Chicken Hutch frames are made from 14 gauge x 1.66" OD Allied Gatorshield® structural steel tubing and sit on your wood base. For growing flocks that require space for up to 800 birds, choose a ClearSpan™ Colossal Chick-Inn Hutch. Colossal Chick-Inn Hutch frames are made from 14 gauge x 1.90" OD Allied Gatorshield® structural steel tubing with 4' rafter spacing.